There is nothing perfect in this scratched and bruised world of ours. No one knew that better than the founders of Eurovision who, faced with a Europe divided as never before after the horrors of World War Two, decided that what the fractured continent needed was a bright shiny singing contest that would draw all of Europe together in a spirit of peace, love, and brotherhood (and sisterhood no doubt once feminism made its presence felt). All very noble and ideal, it did suffer in its execution from the fact that Europe remained defiantly split between two (cold) warring blocs who stared angrily across at each other across the Iron Curtain, a fearsome barrier that no matter of singing would solve. In fact, for years the Soviet occupied parts of Europe staged their very own singing context in direct opposition to the Eurovision Song Contest – the Sopot International Song Contest which became the Intervision Song Contest in 1977 (lasting only till 1980) – further entrenching the divide. It appeared for a good few decades after the Eurovision Song Contest started in 1956 that while it drew Western Europe as closely together as it wanted to be drawn, that it was failing to unite all of Europe in one big Brady Bunch-like happy family. And then the Soviet Union fell apart in the early 1990s. Eastern Europe sprinted like a people possessed from the Russians once-iron clad embrace, and rushed to be a part of everything Western Europe had on offer, which included, of course the gaudy delights of Eurovision. Finally all of Europe was singing together, with the Eastern Europeans enthusiastically embracing the ideal of Europe singing together in a way that Western Europe had long since abandoned, and it looked like the founding fathers might get their wish. Eurovision might finally be the bridge between warring nations, competing cultures, angst political blocs and all would be well among the European family of nations. And then everyone started voting by telephone. In 1997, televoting made its grand entrance onto the shining stage of Eurovision, and the previous system of national juries determining which songs their country would vote for was cast aside, like a cloak no longer needed by an emotionally overwrought (and clearly over dressed) singer. Ostensibly this was designed to democratise the voting process so the people of Europe would finally have a direct say in which song was crowned the winner. On paper it looked like the perfect way to make the contest truly representative of the people who faithfully watched it every year. But in practice? Well, like anything devised by the fevered hand of man, this one had some flaws. One unintended consequence of all this democracy was that people suddenly began voting in blocs. Small at first, they grew in the new millennium to encompass large groups of countries which banded together and happily allotted votes to each other, keeping especially the higher end larger votes safely in-house. Naturally this flew in the face of the ideals of the founders, and the raison d’être of the contest, and so in 2009, the system was changed so that only half of the votes flowing from a country were determined by televotes. The other half were decided by juries made up of “small demographically-balanced juries made up of ordinary people” according to Wikipedia. Problem solved? Well, sort of according to Derek Gatherer, a lecturer in Molecular Genetics in Liverpool who released a paper in 2006 which did a great job of analysing voting in Eurovision over the years. You wouldn’t think statistics could be exciting but Derek found a way to make them come alive (and oddly enough without the aid of spandex or pyrotechnics). His take on the new voting system? But were the voting blocs really as bad people alleged? Some commentators, like the UK’s Terry Wogan who hosted Britain’s coverage of Eurovision until his retirement in 2008, are convinced there was a conspiracy to pervert the course of voting in the contest. “You have various blocs voting. We’ve got nobody to vote for us. Clearly he was speaking from a British perspective, specifically the fact that the UK, along with the other members of The Big Four who pay for the event – Spain, France and Germany – repeatedly post poor scores, usually ending up at the bottom of the pack. While people alleged that this had more to do with poor song selection than dark underhand voting conspiracies, there seemed to be some truth to the fact that people were indeed voting in blocs. But was it indeed part of some dastardly conspiracy, hatched by shady political operatives in poorly lit back street rooms in Stockholm, Istanbul and Zagreb or was it simply people of like cultural mind voting for songs that resonated with them? Well Mr Gatherer, whose paper by the way came with the scintillating title of Comparison of Eurovision Song Contest Simulation with Actual Resulting Reveals Shifting Patterns of Collusive Voting Alliances, believes there is some kind of bloc voting at play. He argued, and I quote, that Eurovision bloc voting was a “horizontally spreading cultural behaviour that has progressively colonised the contest. In other words, it started small but now everyone is doing it. He pointed to the fact that the original voting bloc was Greece and Cyprus, borne out of political solidarity after Turkey’s invasion of the island in 1974. Since those early days, bloc voting has grown like topsy to the point where there are now five groups of countries who essentially trade votes with each other. There is the Viking Empire (Norway, Sweden, Estonia, Denmark, Iceland, Finland, Latvia and Lithuania) and the Balkan Bloc (Croatia, Macedonia, Slovenia, Greece, Cyprus, Serbia and Montenegro, Turkey, Bosnia Herzegovina, Albania and Romania) and the Warsaw Pact (Poland Russia and the Ukraine), the Partial Benelux (Belgium and the Netherlands) and the Pyrenean Axis of Spain and Andorra. Regardless of whether its cultural or political imperatives driving this, the fact remains that it is having an impact on voting. 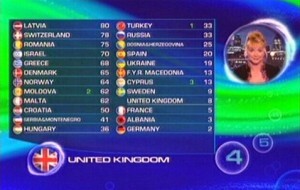 For instance from 1999 through 2008, members of the Viking Empire or The Balkan Bloc won all but two of the contests. The other two years’ winners? Why members of the Warsaw Pact – Russia and Ukraine. He further believes that instead of Eurovision becoming a closed club manipulated by cloaked men in back rooms pulling levers like the Wizard of Oz, that Eurovision is fairer than it once was, not less. This is not today there is some form of bloc voting going on. There clearly is. For instance you only see to watch the way the Nordic countries (Norway, Sweden, Finland, Denmark and Iceland) happily trade votes, or the vote swapping between Baltic neighbours, Estonia, Latvia, and Lithuania. There is also what I like to call the “please Russia don’t victimise us” votes made by former Soviet bloc countries, especially those who border the former superpower like Ukraine or Belarus. 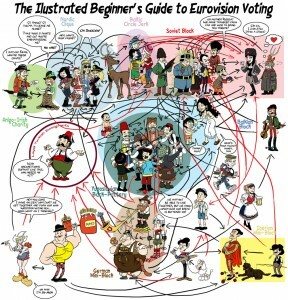 But this likely has far more to do with cultural similarities than it does any sort of coordinated campaign and also reflects a correction of Eurovision voting to include the former eastern block countries who weren’t as prominent in the contest back in the UK/Ireland golden age of the 1990s. Regardless those of why it is occurring, many argue it doesn’t ultimately influence who the final winner is as much as people may think. 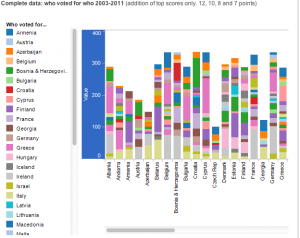 Bjorn Erichson was quoted in a post on eurovisiontv.net “arguing that Russia’s first victory in 2008 was only possible with votes from 38 of the participating countries.” (from Wikipedia – Voting at the Eurovision song contest). Similarly while Azerbaijan won in 2012 by virtue of a sizable chunk of votes from the former Soviet Bloc, it also attracted significant numbers of votes from the rest of Europe, cutting across all the voting blocs. 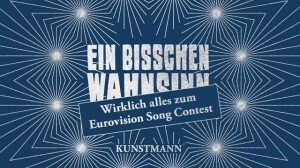 While Derek Gathered argues that “on at least two occasions, the outcome of the contest has been crucially affected by voting blocks”, others like co-author of a Eurovision handbook, Ein bisschen Wahnsinn (A Little Madness), Claas Triebel think it’s all bit of a storm in a glittery teacup. It’s unlikely that the controversy will ever die down, given the potent ability of an enduring conspiracy to explain a myriad of failings by any one country at the contest. It is far sexier, of course, to claim that you were the victim of suspect voting by a bloc (or blocs if you’re really unpopular) than admit that you chose the wrong singer or song. While there is no doubt voting blocs exist, and have an influence of some kind on the final result, what counts in the end, as it always has, is the ability to move as many people as possible as profoundly as you can, and hope they award the douze-point to you. Academics can argue till the singing cows come home, but in the end that is all that matters.